It happened. Issue #4 has joined the club and sold out, not that it is a big surprise given the total success Tangle has been since she was announced over two months ago! According to IDW’s latest news release, while the 2nd printing of issue #1 hits shelves today with a variation of Tyson Hesse’s A cover without the Emerald Hill Zone in the background, issue #4’s reprint will be somewhat different! While keeping the white background that #1-3 will be sporting, it will feature all new character art of Sonic and Tangle by interior artist Evan Stanley with colors by Matt Herms! The second printing will be available at the end of the month on May 30th, the same day as issue #5! Likewise, we gained some new information on the upcoming box set to be released on June 13th! Not only will it contain an exclusive sketch variant of issue #1, but the other 4 copies included will be “virgin” covers, meaning that they will feature nothing but the cover art. No, issue numbers, no creative team credits, no logo, just Tyson’s gorgeous art that you can connect side-by-side to see the full panorama in all it’s splendor! Containing not 1 but 5 new variants makes this box an absolute must for collectors! I am overjoyed to see the new book’s initial success, but am eagerly awaiting the order number for April so that we can see exactly how many books were sold! Keep an eye out for a new article discussing the sales and success of the first books and how it stacks up with previous iterations as soon as those numbers come out! SAN DIEGO, CA (April 27, 2018) — IDW Publishing and SEGA® of America announce today that Sonic The Hedgehog #4, the latest release in the weekly April launch event for IDW’s brand-new Sonic comic book series, has sold through its first printing. The swift sell-out of Sonic The Hedgehog #4 continues the momentum marked by the sell-out of issue #1’s first and second printings, as well as the first printings of Sonic #2 and #3. To meet the demand of fans and retailers, IDW will release a second printing of Sonic The Hedgehog #4 on May 30th with a brand-new cover highlighting the newly-introduced character Tangle the Lemur. The second printing of issue #4 will feature a cover by artist Evan Stanley and colorist Matt Herms. 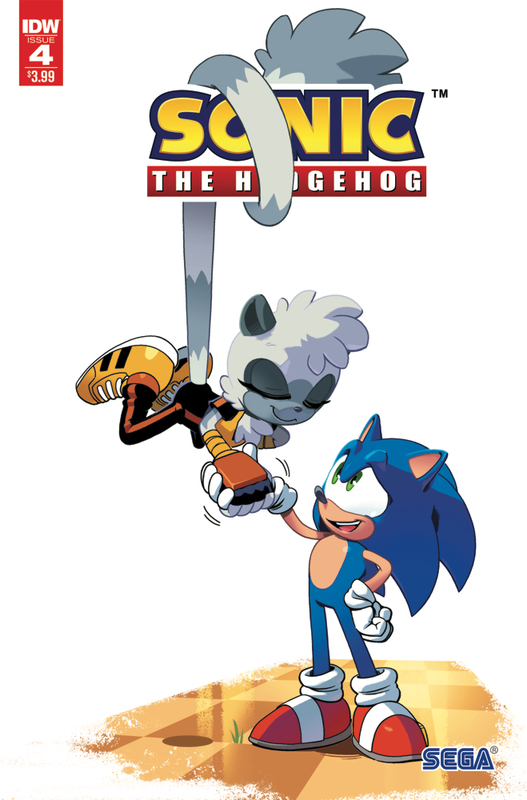 Tangle, the newest female heroic character, and the first-ever ring-tailed lemur in the Sonic universe, shares the cover with the beloved hedgehog hero. Tangle’s first appearance takes place in this very issue, joining Sonic and Blaze the Cat as they race to save a town under attack from the evil Dr. Eggman’s Badnik army. Previous BumbleKast #67: Does Tangle like to “Move it! Move it!”?!? Next Special Limited #7 Variant coming to SDCC 18!